Can you believe it’s already mid-October? That means Thanksgiving is coming up next month, and all of the big gatherings, meals, and celebrations that come along with the holidays. As much as I love fall weather, cozy sweaters, and family meals, I want to be clear on one thing: I’m no Martha Stewart!! I don’t think you need perfectly folded napkins, place cards, handmade crafts, and artful holiday décor in order to make a holiday special. I think all that really matters is bringing together the people you love over a good meal. But here’s the thing: If your kitchen is cluttered, makes you stressed, or is filled with bottlenecks and confusion, you’re going to spend more of Thanksgiving hunting for things and running behind than actually relaxing and enjoying this special time with your friends and family. Declutter and organize your kitchen! Take a look at your kitchen now and resolve to do some serious decluttering before you jump into hosting a Thanksgiving meal. First, you shouldn’t have to worry about where to find things when you’re trying to focus on your friends and family. You should be able to relax and simply enjoy the time together. And second, if your kitchen is organized and not too cluttered, it will be much easier for your guests to move around in the kitchen and help you cook and clean up – major win! As the skies get darker and stormier and the days get shorter, a bright, warm kitchen can become a cozy oasis for your family and your guests. This fall could be the perfect time to brighten up your cabinet interiors. Try painting only the interiors with a fresh coat of paint in a fun color like light turquoise. Or maybe it’s enough to simply clean the grime and dust that builds up in the interiors and get them sparkling a little bit. Or, what if you even remove the cabinet doors completely? That way you can let your prettiest dishes and glassware do the work of brightening up your kitchen, without having to tackle any painting projects. As an added bonus, having bright, friendly, and well-organized cabinet interiors will make it easier for guests to serve themselves when they need something or help you set the table. The more help you get, the less time you have to spend running around in the kitchen and more time you can spend relaxing (and eating) with family and friends this Thanksgiving. Besides the turkey, baking sweets is probably the most time consuming aspect of the Thanksgiving meal. 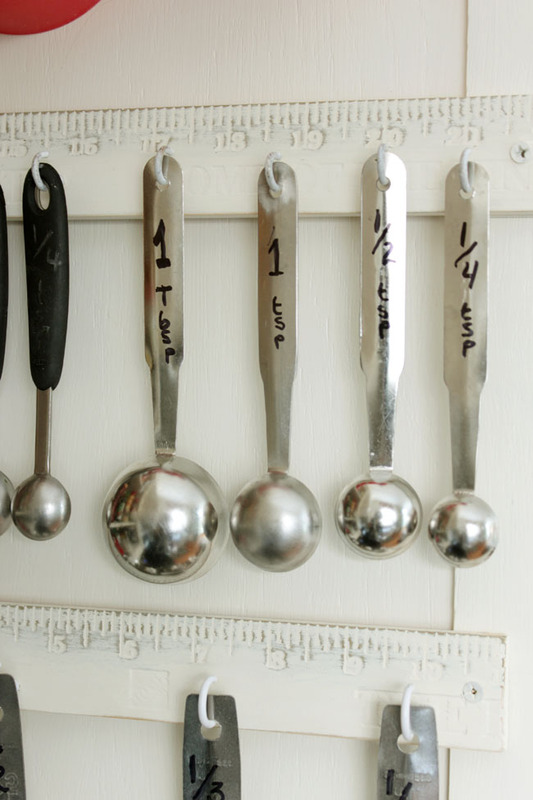 To help all the baking and cooking go smoothly when you’re crunched for time, it is crucial to make sure all your most-used cooking tools – including measuring cups, measuring spoons, mixer attachments, and even cutting boards – are easy to access and organized beforehand. 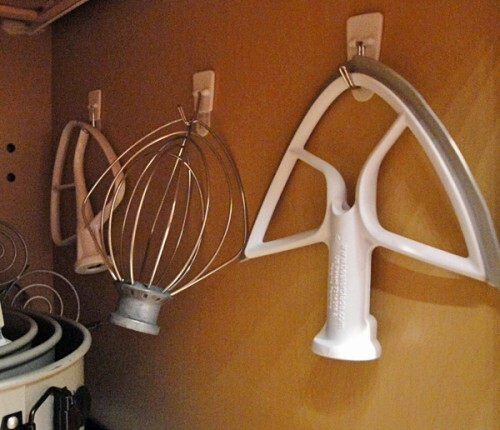 I love to hang hooks on the inside of a cabinet doors to hang these items up so you don’t have to dig for them. I’ve even seen people use desk organizers to hold cutting boards on a cabinet door. Brilliant! When you’re hosting a Thanksgiving meal – even a small one – you’re likely going to be dealing with a lot of different dishes coming together right before the meal. This is true whether you’re doing all the cooking yourself or if you’re doing it potluck style. And that means you’re going to need as much surface area and free counter space as possible – more than you normally need for your everyday uses right now. So here’s what you do: put anything non-essential away. 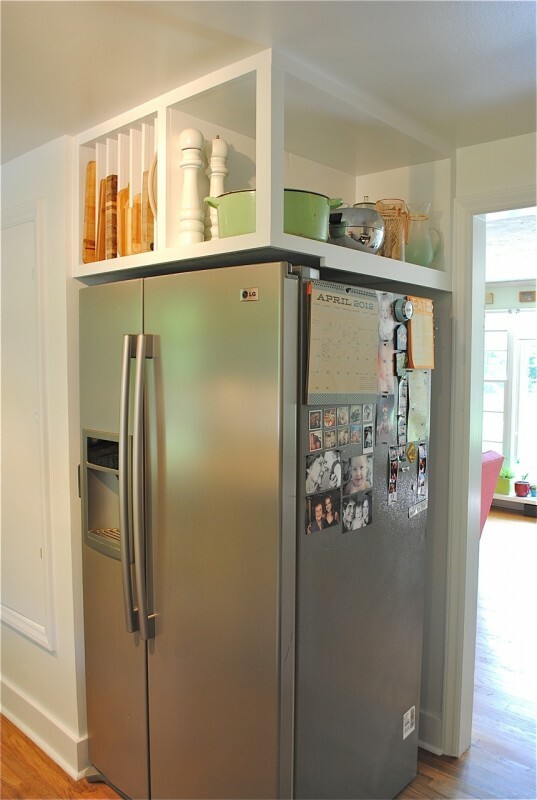 Since a lot of kitchens are already short on storage space, this could mean making the most of all your vertical space in creative ways. 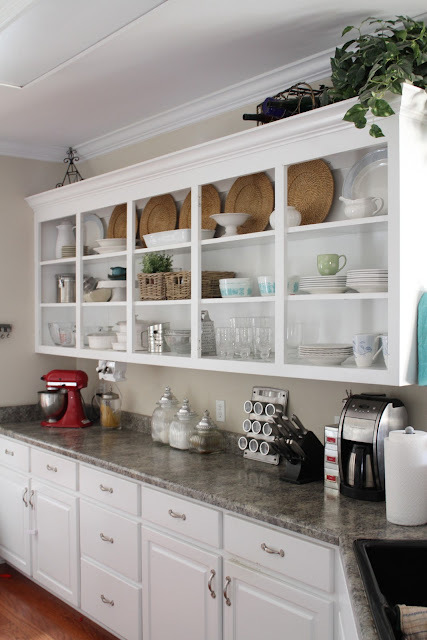 You can even put items that you’re unlikely to use for Thanksgiving or holiday meals on top of your cabinets – or, if there’s enough space between the cabinets and the ceiling, you can even add a second row of shelving. Leftovers are one of the best parts of the Thanksgiving meal. But getting stuck with all the leftovers can be frustrating, right? After all, pumpkin pie is great, but no one wants to eat it for 3 straight days, or have mashed potatoes as your side with every meal for the rest of the week. My favorite trick is to send my guests home with the leftovers. That way, everyone gets to enjoy a bit more of the Thanksgiving meal, but no one has to live off of it all week. That means now is the perfect time to organize your Tupperware drawer or cabinet. Find all of the cheap plastic Tupperware that you’re okay with never seeing again and make sure it is ready to go on Thanksgiving. If you’re extra sneaky, you can use this golden opportunity to get rid of Tupperware that no longer fits its lid or doesn’t have a matching lid, because you can simply cover the tops with plastic wrap for your guest’s ride home. We often try to keep pots pans and lids together in the kitchen. Make sense right? Keeping like things together? But the truth is there’s nothing more frustrating than trying to get a dish started and having to dig around to try to find the right pot with the right lid to match it. And since you’re going be cooking so many simultaneous meals on Thanksgiving, now is the time to get organized with your pot, pans, and lids. I recommend separating them simply because they’re all such different shapes. 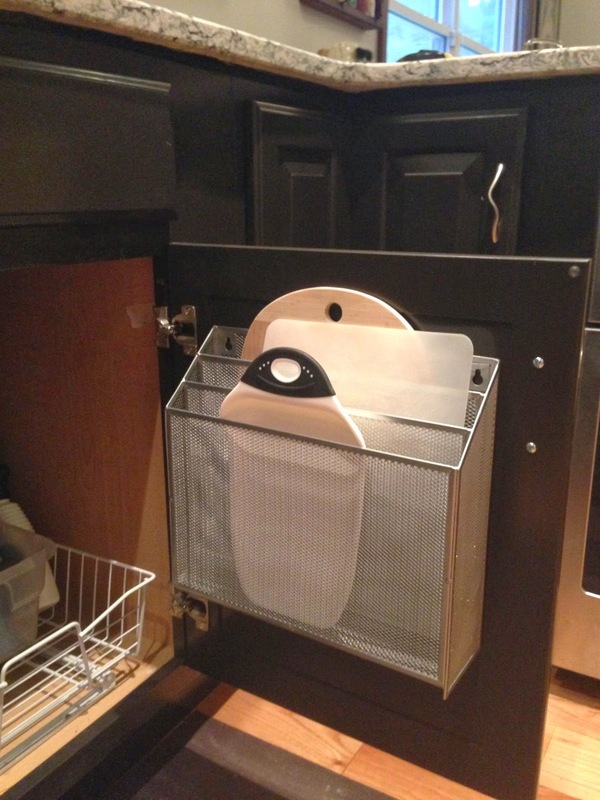 Use a shallow drawer for lids only, or attach a small towel rod to the inside of a cabinet door to hold the lids. You can stack pans on their own or even pick up a simple wire pan organizer to keep your pans organized and easy to access. That way you can grab one pan without disturbing the other ones. If you’re ready to take things to the next level with your pots and pans – and kitchen organization in general, you have to check out one of my favorite tools for kitchen organization: Shelf Genie! They make these amazing custom-designed pull-out shelves that can really transform the way you store things in your kitchen – and help make the most of your space. They showcased one of my own clients in one of their promo videos – I love that it made such a difference for her! When you stack platters and trays on top of each other, you’re going to have to mess up the pile every time you reach for the one that you want. But if you grab a few cheap tension rods and use them to make vertical dividers in a cabinet or shelf, you can organize platters and trays to stand on their side. That way you can easily grab one without disturbing the whole pile, and you can also easily see all of them at once, which is nearly impossible when you’re looking down on them piled up in a stack. This is a crucial step this time of year because during the holidays, especially Thanksgiving, we often find ourselves digging around for spices and ingredients that we don’t often use – such as pumpkin pie filling, condensed milk, certain spices, breadcrumbs, and more. The pantry is one area of the kitchen that can spiral out of control really quickly. So if your pantry is a little crazy right now, you’re not alone! Get organized in the pantry before the big meal, so that you don’t have to stress when it comes to finding the things you need on the day you do all the cooking. 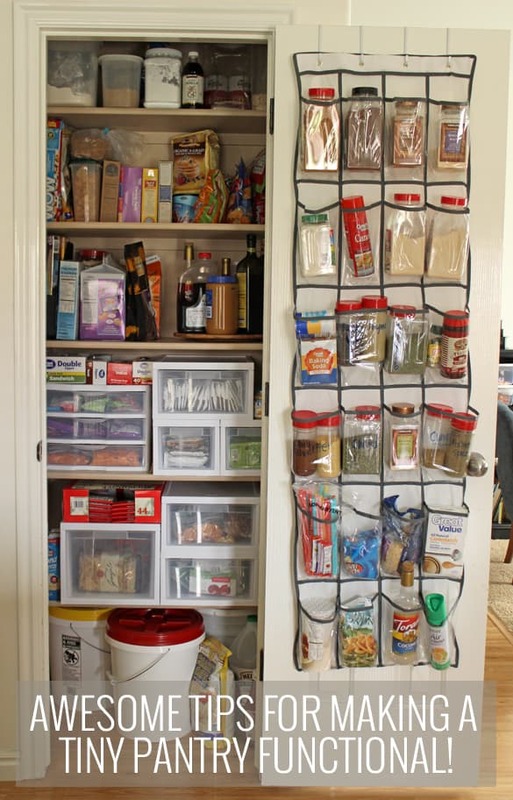 I love using an over the door shoe organizer on the inside of the pantry door. This is a great way to store little things without taking up valuable shelf space. 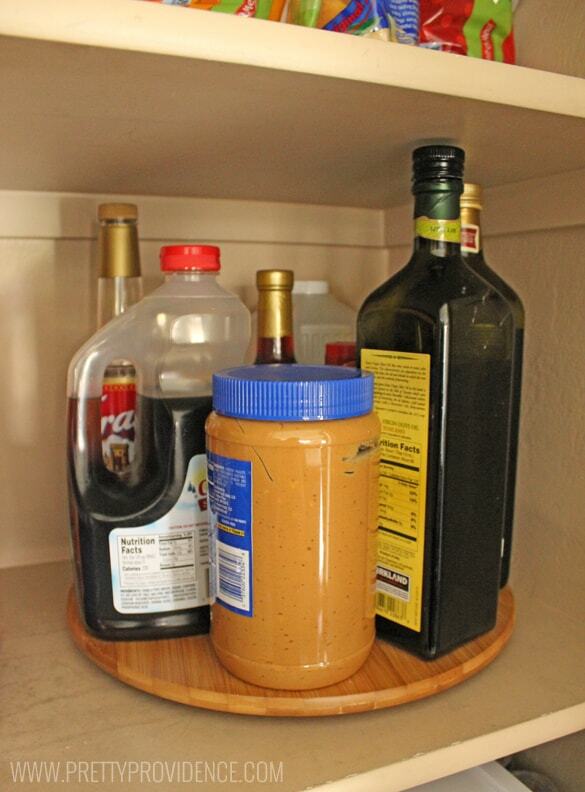 You can also use a Lazy Susan to store things like spices and canned food so that you can easily see and access what you have on hand, rather than letting the more seldom used cans and spices languish in the back of the pantry. All of these tricks are easy, affordable, and can be done quickly. Perfect for tackling on a rainy Saturday afternoon. Just make sure you get them done before company comes!